After the Moomin books started to be translated from Finnish into English in the late 1950s, several early critics clearly couldn’t figure them out. Sure, the books were odd and amusing enough – but the tales had no obvious beginning or end, and no discernible symbolic meaning. In fact, the plump little beings with tails who were at the centre of the stories didn’t seem to carry out a quest or experience any life lesson at all during the course of the stories. Moreover, there was no Alice or Christopher Robin to act as a re-assuring human guide in this strange environment. Not quite as intelligent as their British equivalents, one English reviewer concluded. Well, we’re younger than that now, and can readily cope with all of the above. Yes, the early Moomin books are rambling and episodic, but their whole atmosphere of fertile chaos is very much the point. 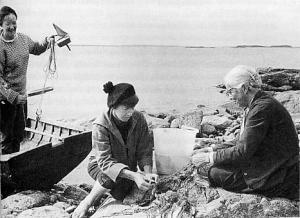 She hadn’t set out to educate anyone, Tove Jansson once wrote. ‘I try to describe what fascinates and frightens me, what I see and remember, and I let it all take place around a family whose main characteristics are probably a kindly confusion, an acceptance of the world around it, and the very unusual way in which its members get on with each other.’ As some perceptive critics have noted, child readers can readily accept a story where the author’s eye wanders off to other characters and events, perhaps because childhood itself can be just as diffuse and generous. In Moominvalley all comers are welcome, and everyone is precious. On the surface, Moomintroll is the central figure. He looks like a round little hippo, and has a touch of Charlie Brown’s tender-hearted naivete about him. It is Moominmamma though, who provides the emotional binding for the entire series. In fact, she could be the supreme example of the motherhood principle in all of children’s literature. 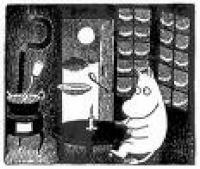 As Alison Lurie pointed out in a 2003 essay, there is no childhood anxiety, no bickering between siblings, no cosmic threat or flood that cannot be resolved by Moominmamma’s calming presence and soothing words, or by liberal servings of the pancakes, birthday cake, blueberry pie, raspberry juice, coffee and jam sandwiches that flow from her kitchen. Usually, it is risky to assume a writer of fiction has been trading directly on their own life experience, but Jansson has made it clear that her own famous parents were the models for Moominpappa and Moominmamma. Her father was the renowned sculptor Viktor Jansson, and some of his work can be seen here and here. In the books, Moominpappa comes across as an energetic bundle of masculine vanity, self-absorbed to the point of folly. According to his daughter, Viktor did not exhibit those traits so much – but like his fictional counterpart, Viktor did have a love of the sea and for the bracing perils of outdoors adventure. Jansson’s mother was the artist Signe Hammersten Jansson, who designed Finland’s bank-notes and over 200 of the country’s postage stamps. “My mother especially,” Jansson once wrote, “ had an unusual capacity for mixing stern morality with an almost exhilarating tolerance. It is a quality I have never met in anyone else.” Again, that is an almost perfect description of Moominmamma – who is eternally caring and inclusive to a fault, while staying firmly in charge of the rituals of home life. In Finn Family Moomintroll, she is the only person who can identify her child after he has been physically altered by the Hobgoblin’s hat. Ultimately, she recognizes her son by his eyes –which is good work, even for a mother. J ansson (in centre of photo with her mother and her partner Tuuliki Pietila) started writing the Moomin books in 1945, and stopped in 1970. As many have noted, the books fall into at least three stages, each different in tone and narrative coherence. There are the loose and carefree early adventures – Comet in Moominland, Finn Family Moomintroll ( which, for new readers, is probably the best starting point ) and Exploits of Moominpappa. In the mid 1950s, she wrote the more structured tales Moominland Midwinter and Moominsummer Madness, still probably the most purely enjoyable stories in the Moomin saga. What makes the Moomin stories so enjoyable – and so popular with parents as well as children – is the wit, compassion and energy present in such abundance. Adults and children respond alike to the same elements in these books, which is quite a rare event. More commonly these days in films like Shrek there is a pratfall for the kids and then a knowing wink – aimed right over the heads of the children – at the adults who brought them. For a while at least, Jansson could strike the same note simultaneously in the youngest child and in the most sophisticated adult reader. In the 1960s, the tone of the stories shifted again. 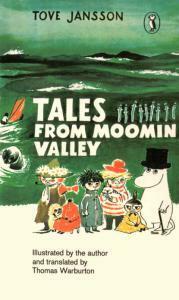 To my mind, the short story collection Tales of Moominvalley ( published in 1962) is Jansson’s high point. It also serves as a useful bridge to the two final dramas of separation and self-discovery ( Moominpappa at Sea and Moominvalley in November ) that are barely children’s books at all. Jansson’s mother died in 1970, the same year Moominvalley in November was published. That last, sombre Moomin book is very much about coping with loss, and with the realization that family and childhood are no longer emotionally accessible – not in any idealized way at least, than can offer comfort. 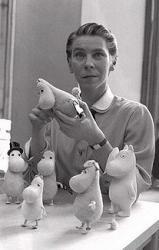 “I could no longer find my way back to that happy valley,” Jansson once wrote, in explaining her decision to effectively close the page on the Moomins. Or again : “ There has been a very clear line, in my work, in the course of which my books have become less and less childish. I finally reached the point where I simply couldn’t write for children anymore….perhaps because I wasn’t sufficiently childish myself anymore.’ In an echo of these sentiments, the characters in Moominvalley in November gradually discover a proper time and method of moving on from childhood. For the last 30 years of her life, Jansson concentrated on writing adult fiction. All the same, it wasn’t a total break. In later years, Jansson devoted a vast amount of her time to correspondence with the thousands of children from around the world, who kept writing to her about the books. Many would address their letters to “Dear Moominmamma.” As Nancy Lyman Huse wrote in an interesting essay in 1991 about this correspondence, Jansson was being pushed into extending her own understanding of what the books actually contain, while discharging a sense of responsibility towards her thoughtful young readers. As she once said to a librarian, you can’t very well leave a letter from a child, unanswered. One English boy wrote to her : ‘I enjoy the Moomins so much because they are so unreal in form, and so real in person.’ No author, Jansson wryly responded, could ask for a higher compliment. Jansson was born in 1914 and died in 2001 at the age of 87. In Moominvalley, she created a fictional universe as fully realized – to take one recurring comparison – as the 100 Acre Wood of A. A. Milne. Think about it : rural setting, naïve hero, much good nature and whimsy, creatures who seem part animal, part human. Milne’s world though is resolutely male-centered ( Kanga excepted) and was inspired, reportedly, by his father’s experience with a school for boys. Jansson’s world is far more female-oriented. It does contain one stereotyped female character ( the Snork Maiden) but it also offers several strong female characters besides Moomimamma ( eg Too-Ticky, Little My and the Groke) and this strength is expressed in quite different ways. The nervous and neurotically house-proud Fillyjonk is also a stereotype. 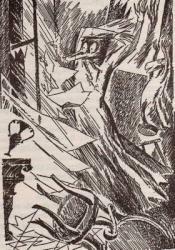 Yet in Tales of Moominvalley she is a very memorable one – a woman who gets liberated ( by a tornado !) from her anxious attachment to her domestic possessions. While the Moomin family is usually the heart of the action, the freewheeling, bohemian universe of Moominvalley also contains a brilliant cast of minor characters. The wandering artist Snufkin is a free spirit who was clearly an alter ego for Jansson, and it is his image that graces the last page of the last Moomin book.While Snufkin lives the lonesome creative life to the hilt, he is also regularly inspired by the prospect of meeting up again with his friends. For many readers, their favourite character is the tiny, gleefully uninhibited brat called Little My – a primal force who constantly provides a snarky commentary on the good-natured Moomins. Beyond them again are other recognisable types, even in translation from the Finnish. I particularly liked the bluff and bureaucratic Hemulens. ‘All round him there were people living slipshod and aimless lives. Everywhere wherever he looked there was something to put right, and he worked his fingers to the bone trying to get them to see how they ought to live.” Most Hemulens are male, though all of them wear skirts. As the US critic Shelley Jackson pointed out in this brilliant obituary for Jansson, even the most timid residents of Moominvalley maintain a self image that “inside their fussy rotundity is an adventurer of the first water, and that if they felt like it, they could show a few people a thing or two.” This may be a Finnish trait, but it is a New Zealand one as well. A prime example is the little dog Sorry-Oo, who dreams of running with the wolves and finally does so – only to discover, almost too late, that they are eyeing him up as lunch. One should also mention those beings in Moominvalley that are like nothing else in literature, save perhaps in Lewis Carroll’s wilder moments. Best of all is the cold and lonely Groke, who is drawn inexorably to warmth and flame, but who freezes whatever she touches, and lays barren everywhere she sits. By the time we get to Moominpappa at Sea, a near teenage Moomintroll has entered into a dangerous kinship of sorts with the Groke. He goes down alone to the beach with a lamp that he swings back and forth – and the Groke dances towards him, swaying in her passage across the grey waves in time to the movements of the lamp. 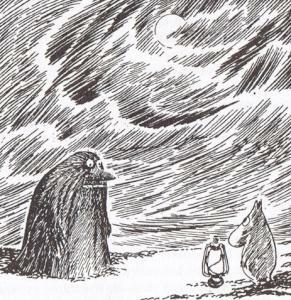 The episode with the Groke – and Moomintroll’s crush on a gorgeous and unattainable sea-horse – are two striking sequences in a book in which almost every beloved character from the earlier books (including Moominmamma ) is going through an identity crisis. In her case, it involves a mental breakdown of sorts. Distractedly, Moominmamma begins to fade into the murals that she obsessively paints on the lighthouse to which her husband has dragged the family, in a doomed attempt to get back to nature. On this island, nature itself lives in terror of the Groke. 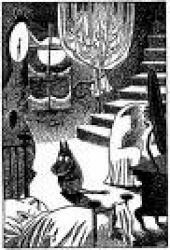 By focusing on the darker, more complex conclusion of the Moomins, I hope I haven’t put off any latecomers. All it means is that these books need to be read in sequence. The high spirit of the first five books is peerless. And to my mind, the complex and melancholy elements that come to the fore in the last two books only make the entire series more admirable. The illustrations are also exceptional. Jansson had spent the first decade of her creative life trying to carve out a career as a painter, and the drawings have always been an integral part of the books’ enduring success. From 1954 onwards, a Moomins comic strip that was drawn initially by Jansson ( and later, by her brother) also became popular, world-wide. It is available in at least three volumes, and is recommended – though it has a singular atmosphere, different in tone and in content again, to any of the books. The story relates Ninny’s journey back to life, and to visibility. Eventually, the unloved child becomes a boisterous member of the Moomin family. Her emergence into sight is funny, and touching. Her paws ‘ very small, with anxiously bunched toes’ appear first – and then the rest of her snub-nosed red-haired self finally explodes into sight in a rush, after she has become secure enough to act spontaneously on her emotions, which inadvertedly cause Moominmamma to fall into a lake. The Nancy Lyman Huse essay contains a moving account of the therapeutic use of this story, within a group of abused children. Unconditional love can serve to conquer the fears that are an intrinsic part of childhood. That sense of tolerance seems finally, to be the overall point. The creatures in Moominvalley qualify for acceptance with all of their quirks, merely by dint of the fact that they exist. As Lurie pointed out in her essay, one of the strengths of the Moomin books is Jansson’s recognition that fear is as strong a force in childhood as the absence or presence of love. Physical threats such as floods, an onrushing comet and all the other unpredictable dangers of life in Moominvalley are conquered by the bonds of family, and by an almost nonchalant air of inclusion. Set the table for one more. For this essay Gordon Campbell drew on quotes and commentary contained in the Children’s Literature Review, particularly the two essays by Nancy Lyman Huse. Shelley Jackson’s obituary for Tove Jansson in the L.A. Weekly (May 9, 2002) and Alison Lurie’s chapter on the Moomins in her book Boys and Girls Forever (2003) were also valuable sources.